JJackson - Pelham,Ga. Excellent oil "This oil is exactly what I needed." Painter Bob - Idaho Trust the name of the machine Kawasaki! 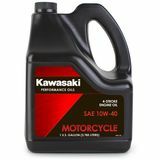 "I used the products serviceing my Kawasaki Teryx for spring,summer,fall use. I have property up near Yellowstone and don’t want to worry about lubrication problems out on the trail! So I trust the name."